Keeping financial records was always a bit of a hassle. But now you can actually enjoy it. 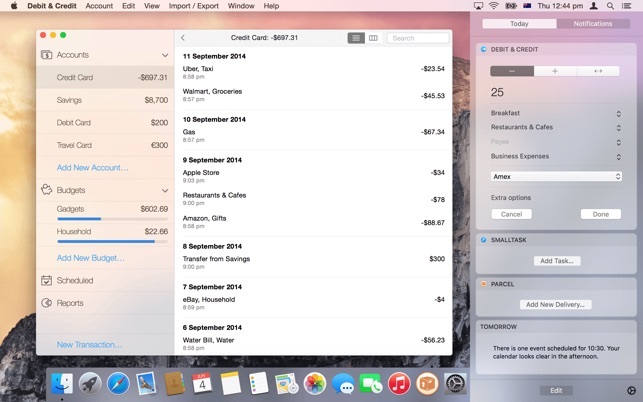 See all your accounts in one place and manage your everyday finances. Creating a new transaction now takes a matter of seconds. The app was designed with simplicity and convenience in mind. It will never require you to make dozens of unnecessary steps to accomplish simple tasks. Debit & Credit has its own app for iPhone and iPad, which you can use to add transactions on the go. It is super convenient and keeps data in sync via iCloud. We know how important it is to be able to import transactions from your financial institutions. That's why we support CSV, QIF, QMTF, OFX and QFX files. 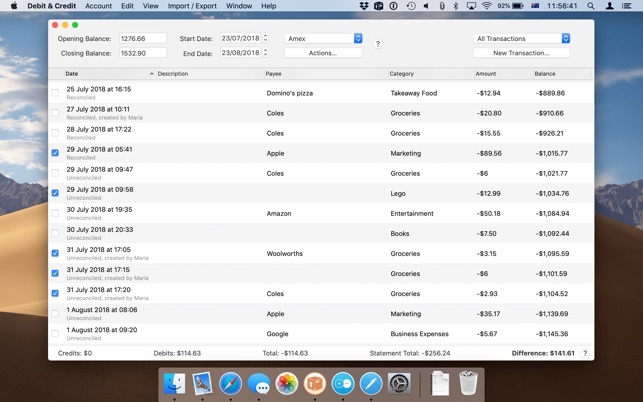 And you can also choose which particular transactions to import from a file, something that not all financial apps know how to do. Do you want to budget expenses on a particular category? No problems. Do you plan to make a transaction in the future and want to be reminded about it? Consider it done. We believe in clean, crisp reports that are easy to read and understand. 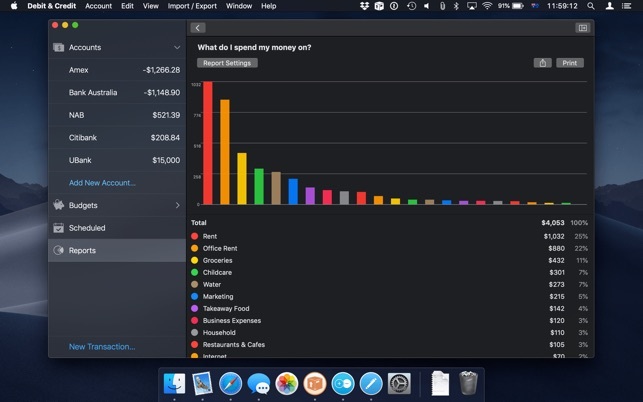 See where and what do you spend your money on. Other types of reports are available too. Do you want to share some of your accounts with someone else? No problems, you can share selected accounts via iCloud while keeping other accounts private. Great for managing family finances! Sometimes we all need extra help to keep our accounts in shape. 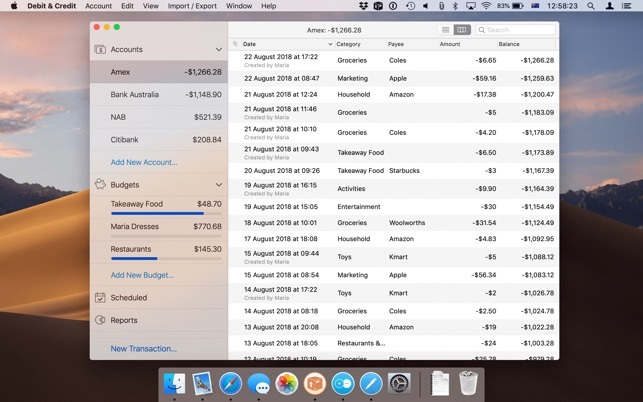 You can easily reconcile your accounts with bank statements in the app to eliminate any disparities. There might be a number of a reasons why you might want to attach files to transactions. You can attach as many files as needed and they will be synced with iCloud. You can even use Continuity Camera to scan documents or take photos with your iPhone and receive them in the Mac app. Split categories, Touch ID support, pending transactions, transaction export, transaction tags, printing reports and saving them as PDF files - all those and many other features are at your disposal when you need them. We will never ask you to create an account or provide any personal details. All data is stored in iCloud, it is not available to anyone except you. In case of any questions please don't hesitate to contact support@debitandcreditapp.com. After using this app for quite some time (close to a year) I still am grateful it exists and happy that I had something to replace Microsoft Money with, but being a person that likes to keep on top of keeping my finances organized, I still wish it would save the last opening balance automatically, as I sometimes forget to write that down and then I get all messed up. Other than that it is still great and has been a tool that’s made my life tons easier!! I know it was made for monthly balancing with a statement, that’s just something I would improve on. Thanks for the app! As an avid Microsoft Money user for over a decade I was upset and spent too much money on apps that just weren’t comparable or compatable. With this free app I was even able to import my account. This is working good for me. The only thing I wish that would be improved is; I would really appreciate it if the opening balance & date were to be automatically saved in the reconciliation window when you begin to balance your account. I have been saving my info in a word file, then opening it to reflect back on when balancing. But it would be comparable to what I used money for if it had this feature! Please please see if you can add this feature!! Thanks for your program! I did buy the full version (less expensive than others) but found I didn’t even need the full version. Pleas take into consideration making the opening balance and date automatically saved from last balance!!! Thanks! Thanks for your feedback! At this point statement reconciliation is supposed to be used with actual statements from banks, where you already have opening/closing balance and date. Very impressed with the simplicity and function of this app. (1) I love the privacy approach - incredibly simple and straighfoward. (Everything is on your own iCloud account. The developer sees nothing.) (2) The account sharing feature was a little buggy, but once a I reset my devices we were up and running. 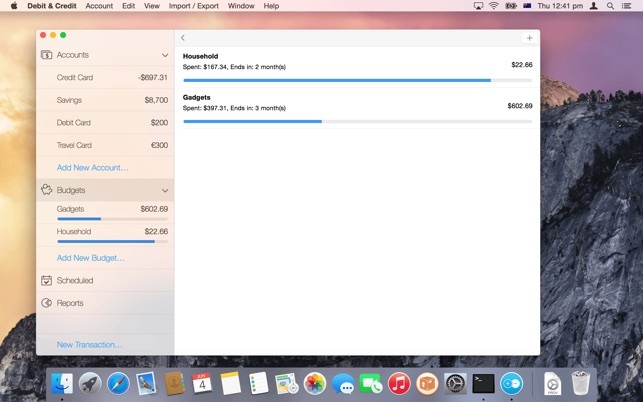 (3) I set up a simple envolope system by creating additional accounts not connected to actual accounts. It works great. (4) The reporting feature is a bit limited at this point. Hopefully I’ll be able to run custom reports in the future. (For instance, if I could compare the toal of my envolope accounts to the total of an actual account, that would be great. Or if I could save multiple reports for tax purposes, I’d be good shape.) (5) Downloading my transcations is currently limited to MacOS. My bank does not allow me to download my transcations via CSV on iOS. If privacy could be maintained, I’d love to see some type of improvement in this area. (6) It would be nice to see some consistency around entering “new” transactions, or “new” scheduled transactions, etc. As a new user, I’ve been thrown off by the interface a bit between different categories and platforms. (8) The price seems fair and reasonable. (I was paying about $70/year for other services.) / Overall, nice work Ivan! Keep it up! I’ve used a lot of different personal finance products and I could see myself sticking with this one for a long time. 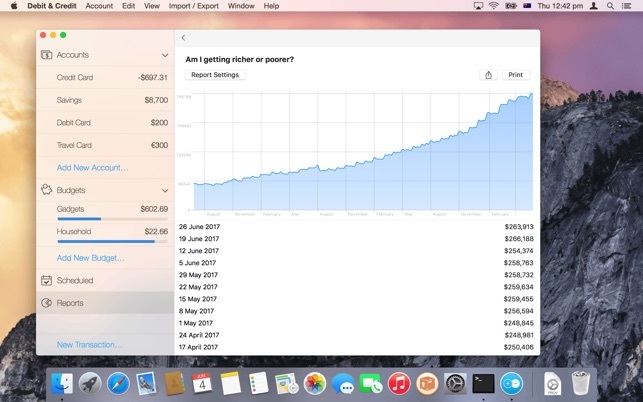 Easy to use and keep track of your finances! 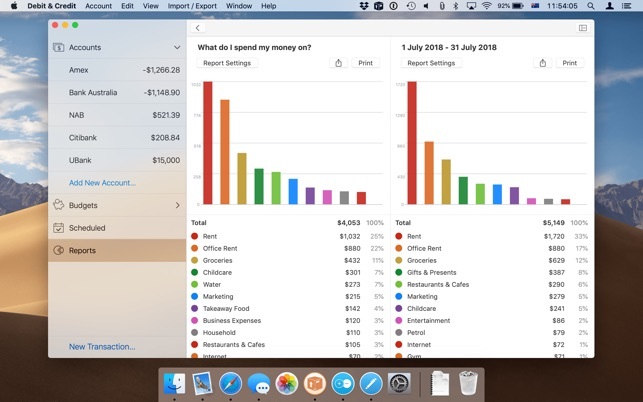 I am a non-practicing accountant and I used to keep track of my personal finances in excel (mostly bills and credit card payments)-sounds old-fashion but I tried other apps out there and always ended up going back to excel because they were just complicated and not practical. This time around I decided to give another app a chance and to my surprise, this has been by far the easiest and most practical one to use. It is exactly what it claims to be “debits and credits”! I basically update it as I go, when I spend or pay or transfer money between accounts, I just do it on spot as opposed to waiting until the end of the monthly cycle to update my balances. I now have a clear picture of where I spend my money, all my credit balances, savings/checking accounts and with the reporting functinality I can see whether I am getting poorer or richer! I am getting poorer though but at least I can see where the money is going :). It has a budget functionality that I haven’t used. I do use the schedule functionality which saves you a lot of time by pre-booking transactions you know happen on a monthly basis (fix expenses), you can always go back and modify if anything slightly changed or if you are skipping a payment. I abosolutly love it! for now this works wonders for me and has done what other apps have never done before for me - make me keep using it! Happy user for about 3 months.